Lernsys Homeschooling Academic Video Courses. Homeschooling Grade 3 Math Video Course With Curriculum, Worksheets, Answer Keys, Tests and More! 0 Welcome to 3rd Grade Math! You will be able to identify the ones, tens, and hundreds place in a number. You will also be able to tell the value of a digit in a number. This is a review of this lesson's worksheet. You will be able to add and subtract two-digit numbers without regrouping. This is a review of 2nd grade concepts. You will be able to determine whether a number is even or odd. You will also be able to skip count. You will be able to find a pattern to complete in and out tables (also known as function tables). You will be able to identify the ones, tens, hundreds, and thousands place in a number. You will also be able to tell the value of a digit in a number. You will be able to round to the nearest ten. You will be able to round to the nearest hundred. You will use the symbols <, >, and = to compare numbers. You will compare numbers to put them in order from least to greatest and greatest to least. You will add three digit numbers with and without regrouping. You will solve real-world situations using addition. You will subtract three digit numbers with and without borrowing. You will subtract three digit numbers across zeros using borrowing. You will solve real-world problems using subtraction. You will be introduced to vocabulary and concepts about time, including year, month, day, hours, minutes, and seconds. Please note this video does not have a worksheet. The worksheet with the next video lesson will cover the concepts from the 2-2a and 2-2b videos. You will use an analog clock to tell time to the hour and half hour. Please note this video does not have a worksheet. The worksheet with the next video lesson will cover the concepts from the 2-3a and 2-3b videos. You will use an analog clock to tell time to the quarter hour. You will learn strategies to determine the amount of time that has passed. You will use a thermometer to tell temperature. You will learn vocabulary and concepts related to money. You will count sets of coins and bills. You will add two sets of money. You will subtract two sets of money. You will solve real-world problems with addition and subtraction. You will be introduced to vocabulary and concepts relating to multiplication. You will multiply by 0. You will multiply by 1. You will multiply by 2. You will multiply by 5. You will multiply by 10. You will multiply by 4. You will multiply by 8. You will multiply by 3. You will multiply by 6. You will multiply by 7. You will multiply by 9. You will solve real-world problems using multiplication. You will be introduced to vocabulary and concepts relating to division. You will use the relationship between multiplication and division to create fact families. You will divide by 1, 2, 5, and 10 using what you know about multiplication. You will divide by 3, 4, 6, 7, 8, an 9 using what you know about multiplication. You will solve real-world problems using division. You will identify common fractions. You will make equivalent fractions. You will add fractions with the same denominator. You will subtract fractions with the same denominator. You will learn vocabulary and concepts for measuring length, weight, and capacity. You will learn vocabulary to help measure the length of objects. You will use a ruler to measure objects to the inch and half inch. You will use a ruler to measure objects to the quarter inch. You will use a ruler to measure objects to the nearest centimeter. You will learn vocabulary for measuring the capacity of liquids. You will learn vocabulary for measuring the weight of an object. You will tell the difference between polygons and non-polygons. You will review two dimensional shapes and identify their properties. You will find the perimeter of quadrilaterals and triangles. You will find the perimeter of a quadrilateral with missing information. You will find the area of a quadrilateral. You will determine the length and width of a quadrilateral given its area. You will identify the attributes of 3-D shapes. You will analyze a tally chart. You will analyze a pictograph. You will analyze a bar graph. You will use data to create a graph. You will use probability to determine if an event is likely or not likely to happen. Students in this course will develop a solid foundation for mathematics. The topics in this course are divided into eight sections: place value, addition, and subtraction; time and money; multiplication; division; fractions; measurement; geometry; and data. In each section, students will learn different strategies and techniques to solve problems. Real world examples are used so students can see and understand how math is relevant in everyday life. This course consists of 73 video lessons. Each video starts off with a goal and vocabulary for the lesson. Every lesson has a video, a worksheet, a video review of the worksheet, and a quiz. There are a variety of printable manipulatives for hands-on learning. Other resources available to parents include answer keys for worksheets, multiplication and division flashcards, and division practice pages. 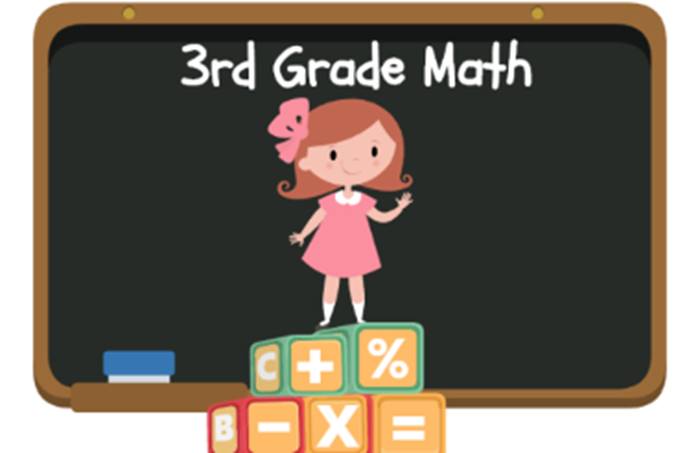 When a student completes this course, they will be prepared to tackle 4th grade mathematical skills and concepts. Students will be able to transfer the concepts andproblem solving skills learned in this course into the everyday situations they may encounter. This video course is aimed at Grade 3 students (ages 7-10). Students will find the course is challenging and engaging throughout the entirety of the course. Students enrolling in this course should have an understanding and mastery of typical Grade 2 Mathematics content and skills. 73 quizzes (one for each lesson). Each quiz has 1-3 questions. The course's syllabus is given below. Upon completion, student will be prepared for fourth grade concepts and skills. I have been an educator for the past 15 years, working in a variety of public schools and settings. I currently work for an online school in Pennsylvania. I love teaching math, and I hope you will love it, too! I look forward to learning with you! Answer keys for each worksheet in Section 1. Students can print and cut out these manipulatives to help them build an understanding of base ten concepts. Answer keys for each quiz in Section 1. Answer keys for each worksheet in Section 2. Students can print and cut out these reproductions of American coins and bills to help them during the lessons on money. Answer keys for each quiz in Section 2. Answer keys for each worksheet in Section 3. These resources will help students to reinforce learning multiplication facts. Answer keys for each quiz in Section 3. Answer keys for each worksheet in Section 4. These resources will help students to reinforce learning division facts. These worksheets provide extra practice for mastering division facts. Answer keys for each quiz in Section 4. Answer keys for each worksheet in Section 5. Answer keys for each quiz in Section 5. Answer keys for each worksheet in Section 6. Answer keys for each quiz in Section 6. Answer keys for each worksheet in Section 7. Answer keys for each quiz in Section 7. Answer keys for each worksheet in Section 8. Answer keys for each quiz in Section 8.